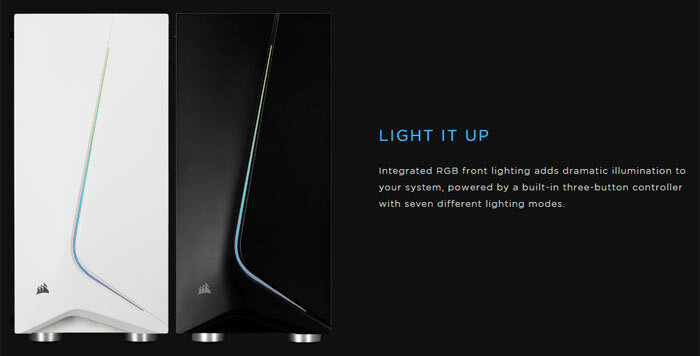 Corsair has announced the new Carbide Series SPEC-06 RGB chassis. 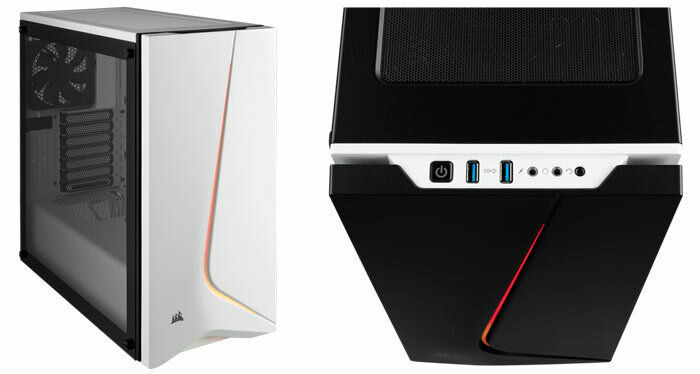 It shares the asymmetric looks of other recent SPEC cases but delivers quality upgrades, such as a real tempered glass side window, a PSU shroud, and an RGB LED-lit front design. The new Corsair Carbide Series SPEC-06 RGB chassis is available in black or white. 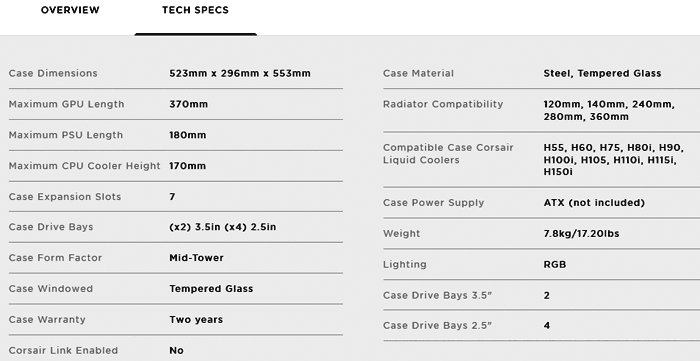 It measures 523mm x 296mm x 553mm, quite a bit larger than the SPEC-05, released a few weeks back, but it is still described as a "compact mid-tower ATX case". As mentioned in the intro there are a number of quality upgrades in the SPEC-06, compared to its sibling too. Probably the most noticeable is the front RGB lit 'hockey stick' flourish. This lighting is controlled via a three button hardware controller offering seven modes. In the cheaper chassis this asymmetric gap in the front panel was lit only by a red LED intake fan behind it. Cooling options are plentiful. There is a direct air path over what are expected to be the hottest component areas. Corsair pre-installs a pair of 120mm fans but you can fit six in total (3x front, 1x rear, 2x top). Another cooling option is to fit an AiO cooler radiator up to 360mm (such as the Corsair Hydro Series H150i Pro RGB). There is room for a modicum of components including; 2x 3.5-inch drives, 4x 2.5-inch drives, plus 7x expansion cards. Maximum compatibility is 170mm for cooler height, 180mm for PSU length, and 370mm for graphics card length. Other things Corsair would like you to consider are this chassis quality steel and tempered glass construction, its "builder-friendly internal layout," with a dedicated cable routing compartment, and the PSU shroud offering clean looking build options. In an email to HEXUS, Corsair said that the Carbide Series SPEC-06 RGB chassis is available immediately from the usual retailers and direct. Here in the UK the black and the white model are for sale at £84.99. Buyers get a two year warranty. Will this case have airflow from the front? It looks like the first picture under the video has an RGB fan in the front on the bottom but that's just a guess.